This banana bread recipe without eggs is easy to follow and you can make yummy and flavorful banana bread from scratch at your home. The calories in a banana (medium sized banana) is 105 calories and we use 3 medium sized bananas to make this egg free banana bread. There are different ways you can make a delicious loaf of banana bread without eggs. 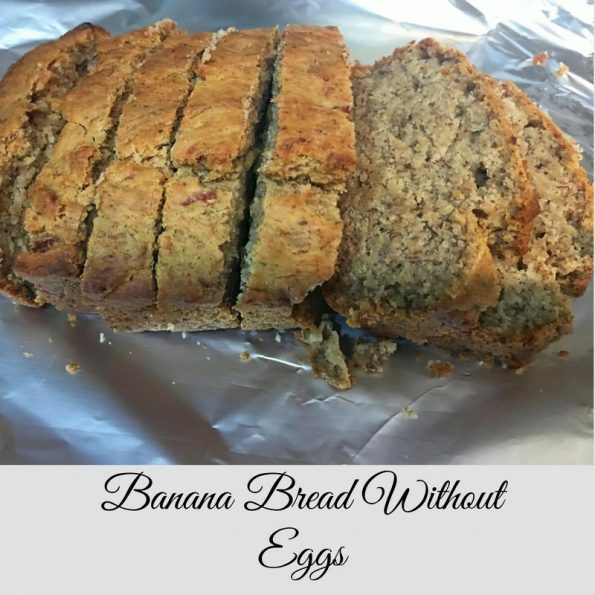 This is an easy banana bread recipe without eggs and you just need one extra ingredient to replace the eggs and make the banana bread using this egg free banana bread recipe. In fact, banana bread is one of the most easy and delicious quick breads we can make from scratch at home. Homemade banana breads make easy and delicious snack for kids after school as well, as they are one of the most kid friendly fruit breads. I love the flavor and smell of banana breads which fills the home as they are baked in the oven. As I mentioned above there are many recipes for making banana breads without eggs. 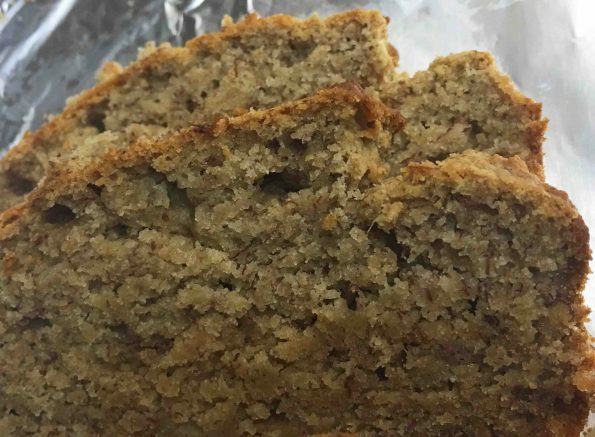 This egg free banana bread recipe uses ground flax seed powder (which is mixed with warm milk in the recipe) as a replacement for eggs, and flax seeds add extra fiber to the bread. You can buy organic ground flax seeds powder here. We often have bananas at home, and by the weekend there will always be some leftover ripe bananas which are perfect to be used in banana breads. If you have very ripe bananas you can use them as they are the best for baking. The basic banana bread recipe has eggs in it, but we can also easily make egg less banana bread. 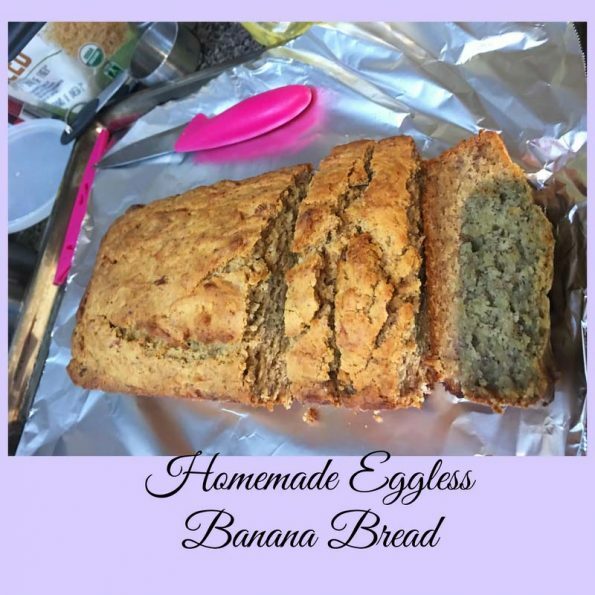 Here is one of the easiest ways to make a delicious loaf of banana bread that is also egg free! You can use the banana bread as an evening snack or a save them for next day morning breakfast! 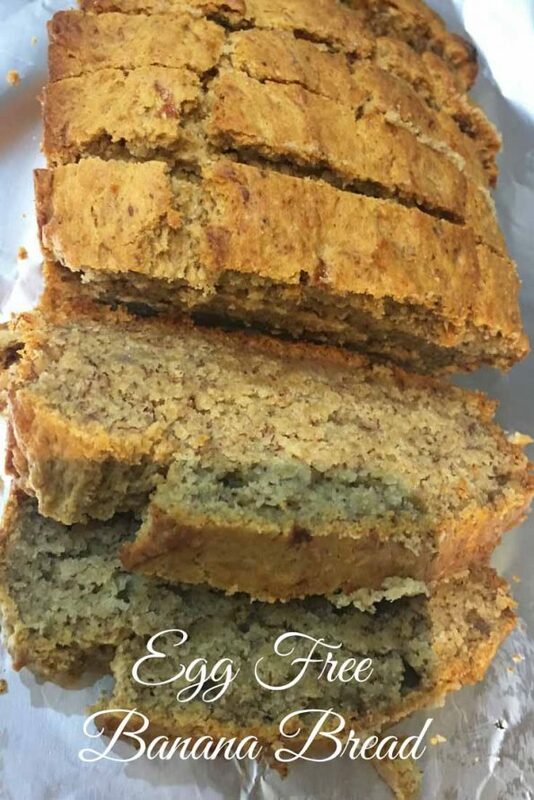 Easy, eggless banana bread from scratch is simple and easy to make, delicious and makes a kid friendly snack, dessert (serve with some frosting if needed) or breakfast. Mix dry ingredients in a bowl - flour, baking powder, baking soda and salt. Mash the bananas and keep it aside in a bowl. Mix the ground flax seed powder with warm milk in another bowl, add the vanilla extract and keep it aside. Melt the butter and beat the butter and sugar well. Mix together the butter sugar mixture, milk (with flax seeds and vanilla extract) and mashed bananas together. Pour this mixture of butter with sugar, milk and mashed bananas to the bowl of dry ingredients. Gently stir together every ingredients until they are well combined. Grease a bread loaf pan with melted butter or oil and then pour the banana bread batter into it. Bake for about 50 minutes or until a toothpick inserted in the center comes out clean. Allow the bread to cool down before you slice it up and serve! Hope you found this post on banana bread recipe without eggs (made using ground flax seeds powder) useful!